Birds on Tap! 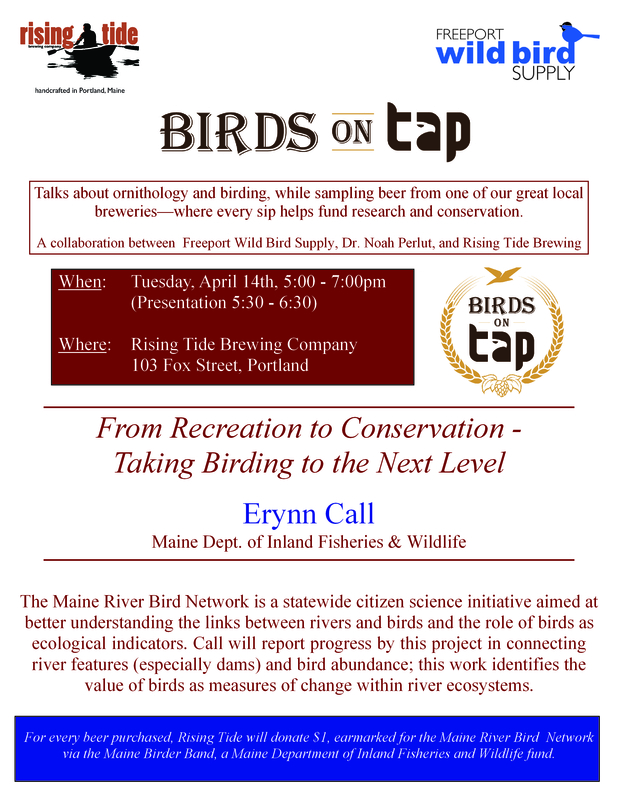 A new speaking series from Freeport Wild Bird Supply begin 4/14 with Erynn Call at Rising Tide Brewing Co.
OK, so that was kind of a long title, so I think you get the idea. And we are excited about this! Freeport Wild Bird Supply (FWBS) is excited to introduce a new series of talks that will feature speakers in the field of ornithology and conservation. But, these are not just ordinary presentations. Each one will be held at one of our favorite local breweries allowing guests to sample beers while learning about bird research that is being conducted in our region. In addition, a portion of the proceeds will be donated to further the work of the featured speaker. “It is our hope that these programs, with a casual atmosphere, will help bridge the gap between ornithologists, bird watchers, and the general public,” said Derek Lovitch, FWBS co-owner. “Building on our successful series of book signings at the Maine Beer Company, Dr. Noah Perlut of the University of New England, approached us to expand our series to include academic and more scientific presentations. We can think of no better partner than one of our favorite brewers, Rising Tide Brewing Company.” “By hosting these events in Portland, we are equidistant between Bowdoin College and the University of New England, within walking distance of the University of Southern Maine’s Portland campus, and of course are right in the heart of the Portland population. This central location should provide easy access for students, birders, and the general public from a wide area,” added Jeannette Lovitch. The series kicks off on April 14th at Rising Tide Brewing Company (103 Fox Street, Portland) with Erynn Call. In her talk titled From Recreation to Conservation – Taking birding to the next level, Call will highlight The Maine River Bird Network, a statewide citizen science initiative aimed at better understanding the links between rivers and birds and the role of birds as ecological indicators. River features such as water flow, presence of dams, and land cover may be altered by climate change, river restoration, and urbanization. The project has made progress in shedding light on relations between river features and bird abundance. This knowledge improves the value of birds as measures of change within river ecosystems. Call discovered her passion for birds while growing up in northeast Michigan and developed a keen interest in avian ecology while studying at Michigan State University. Research on reproduction, movement, and survival of Ruffed Grouse, Wild Turkey, and Bobwhite quail led her to Michigan, Kansas, and Missouri. After working as a wading bird ecologist with the South Florida Water Management District Everglades Research Division and as a wildlife biologist in the Upper Peninsula of Michigan, she decided to pursue a doctorate degree at the University of Maine – Orono. The statewide citizen science initiative – Maine River Bird Network – was formed from these efforts and continue as part of her new position as the Raptor Specialist in the Wildlife Research and Assessment Section Bird Group of Maine Department of Inland Fisheries and Wildlife. “We’re pleased to work with our friends at Freeport Wild Bird Supply to support the Maine Birder Band and their conservation efforts.” adds Stasia Brewczynski, tasting room manager at Rising Tide. The event is free – non-alcoholic beverages and light snacks will be provided free of charge. For every beer purchased, Rising Tide will donate $1 directly to Maine Birder Band, a Maine Department of Inland Fisheries and Wildlife fund which supports efforts to protect Maine’s birds, bird habitat, and access for birders, earmarked for the Maine River Bird Network. This entry was posted in Events and tagged "Birds, Birds on Tap, events, Freeport Wild Bird Supply, Maine Riverbird Network, Portland, programs on March 25, 2015 by Derek.